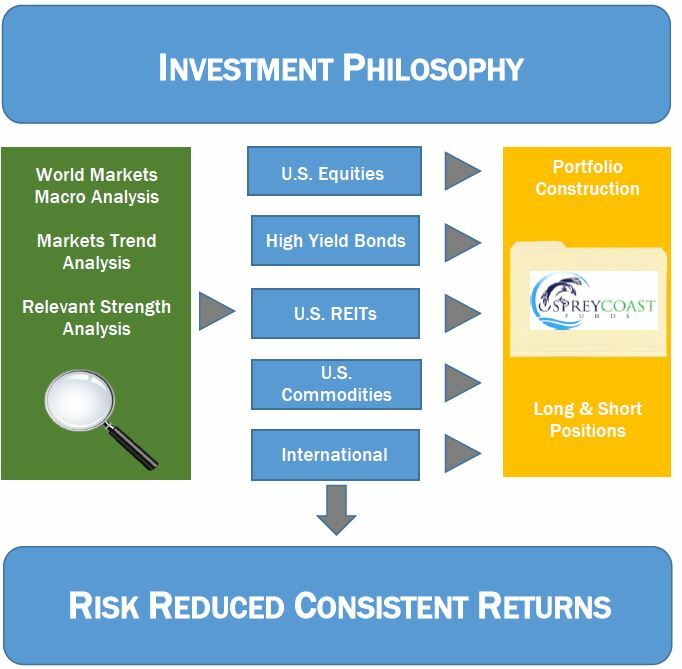 OspreyCoast Funds' investment philosophy uses a discretionary systematic strategy based upon the time-proven concept of Momentum Investing which seeks to capitalize on existing market trends - both uptrends and downtrends. To maximize positive results derived from investing with the market trends, OspreyCoast Funds utilizes Relative Strength investing as its primary investment methodology. A top-down approach is taken to identify which U.S. market sectors and International countries are the strongest and which are the weakest. Once identified, the investment portfolio is constructed with Long positions in the strongest candidates and Short positions in the weakest candidates. The core investment strategy invests in Exchange Traded Funds (ETFs) and U.S. S&P 500 equities. The strategy is a Long/Short strategy that invests in multiple asset classes. Investment positions may be long/neutral or short/neutral. Trading experience has shown that each asset class has unique trading characterics that require customized technical settings. Several asset classes are traded using intermediate trend following techniques while other asset classes use minor-trend following techniques. When the market is not trending, mean reversion techniques are used in striving to generate profitable returns. OspreyCoast Funds has implemented the Global Industry Classification System (GICS) structure in its ETF and U.S. Equity sector structure. Each market and U.S. industry sector has its own benchmark index used to determine relevant strength rankings of it's constitutent ETFs or stocks. Performance results will be reported in compliance with the Global Investment Performance Standards (GIPS). Risk Management is a very important component of OspreyCoast Funds' investment philosophy. Our multi-layered risk management program begins with the investment vehicles - Exchange Traded Funds (ETFs) and Large Cap U.S. equity stocks. The ETFs are broadly diversified and if one of the ETF's holdings happen to fail its impact to the ETF would be minimal. The U.S. Large Cap stocks belong to the Fortune 500 and are among the most financially stable companies in the world. Investment funds are divided into five "silos"designed to balance market risk. Each investment position is made as a part of a risk reduced portfolio with each position averaging no more than 1.00% of it's respective silo's funds. An exception is made to the 1.00% position rule for low volatility asset class positions such as High Yield Bonds or U.S. Treasuries ETFs. These asset classes may reach a maximum of a 2.0% position. All investment positions are initially protected by Technical Stops with subsequent trailing Protective Stops which activate as the position increases in value. An additional risk management technique is employed in selecting asset classes that possess an overall low correlation amongest themselves. The fund's goals are to provide a consistent positive annual return from it's well diversified portfolio. Each asset class will contribute to the fund's overall blended composite return.